The minute I came across this creation from one of my favorite bloggers, I knew I had to try it. 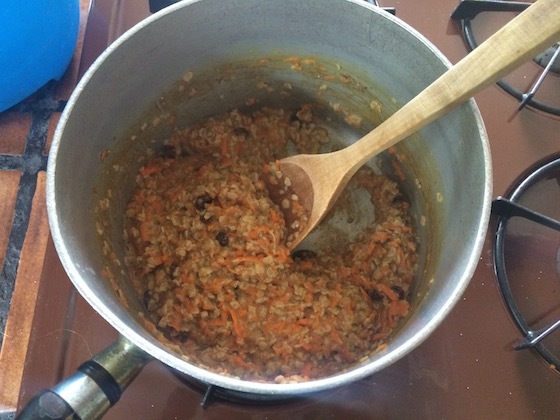 I’m always looking for creative ways to sneak more fruits and veggies into my meals, but carrots in oatmeal was something that never crossed my mind! I love the sweet and spicy combination of a great carrot cake. These flavors are perfectly replicated in this steamy and filling bowl of oats. This discovery is definitely making my mornings just a little sweeter! Bring almond milk and water to a boil in a medium pot. Add remaining ingredients and cook, stirring, until oats are creamy and most of the liquid is absorbed. Consult the oat package for precise cooking times. I love this dish topped with a spoonful of peanut butter. Add a splash of maple syrup, too, if you like your oats a little sweeter.